Who are Mayo Farm Systems? CC deantus, trading as Cow Comfort, have been manufacturing the Mayo Original in the West of Ireland since 1986. Thomas Duffy, the founder of the company, made the very first of these mats for his brother who runs a small dairy farm in the area. At the time, he was working as a chemist in a shoe sole plant & realised that the EVA he was working with would surely make a far superior bed for animal comfort in comparison to the traditional bedding in use at the time. He was right! Gaining publicity from an entrepreneurial television show which was being broadcast at the time, the company quickly expanded and the Cow Comfort brand and quickly became a recognised name in the Irish farming community. In 1989 Thomas’ brother in law Joseph Egan, a teacher living in Lancashire, imported and sold the first Mayo Original to British farmers. Sales grew rapidly in the early years and the company quickly established itself as a market leader and a name synonymous with quality – a position the company has never lost. Many of the very first mats sold are still in use today. In 2010 The Mayo Mattress was launched in the UK. This revolutionised the market and has rapidly replaced the Mayo Original as the foremost product for animal comfort with sales exceeding 20,000 per annum. 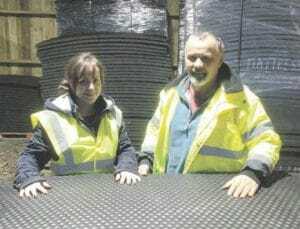 Cow Comfort is the only company in the world that wholly specialise in the manufacture of Animal matting. The products are designed, formulated and manufactured exclusively for the bovine and equine markets. Mayo Farm Systems, Joe’s Lancashire based company now run by his daughter Niamhanna, under which umbrella Mayo Cow Comfort and Mayo Horse Comfort falls, has grown to carry a wide portfolio of high quality products including the Mayo Automatic Hydraulic Scraper system, Mayo Calf rearing, Mayo Horse Comfort, Mayo Cubicles & Mayo Husbandry equipment.